We have talked about “Gutters for Storage and Shelving”, “Garden Gutters” and now “Garden Gutter Patio Pizzazz”, which is a combination of the previous blogs with storage and planting all for the backyard! Have you ever thought about using gutters to enhance your outdoor spaces? Try it and be the envy of your neighbors! 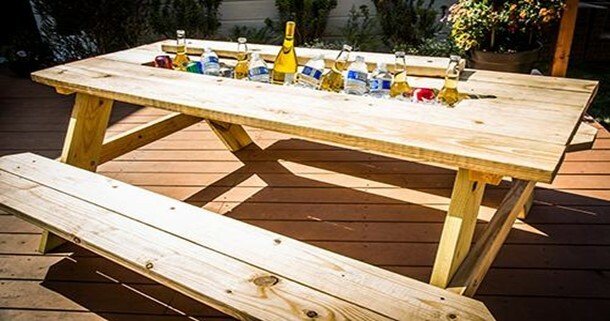 Gutterize your picnic table by popping out the center board and dropping in a piece of gutter the same size! Seems simple doesn’t it?! IT IS! What you decide to put in the center gutter is completely up to you! The sky’s the limit on how you use this new space! Turn your picnic table into a planter by adding brightly colored annuals or some adorable succulents! You can plant almost anything in there! Be sure to choose something that doesn’t grow too far or require a ton of space for root systems. You could even plant vegetables if you like the idea of watching your food grow right where you eat it! Some flowers that we suggest are ferns, herbs, impatiens, ivy, marigolds, or petunias. Just remember to trim the ivy! Fill the gutter in the center of the table with ice! This makes a great place to keep your beverages chilled during the hot summer months. Keep in mind ice will need to be replenished as it melts, and you will need to either add a few small drainage holes or make sure the gutter can be removed easily for emptying the melted ice. Add a spicket and some tubing at the base to drain off the water or tap a few holes in the bottom of the gutter to allow the water to drip through to the ground! So easy! Use the installed gutter as a space to store condiments, cutlery, napkins, sauces and whatever else you’d like for outdoor dining! What a unique way to keep everything organized and the clutter off of the table! Are you limited on garden space or want to try something to impress your neighbors? 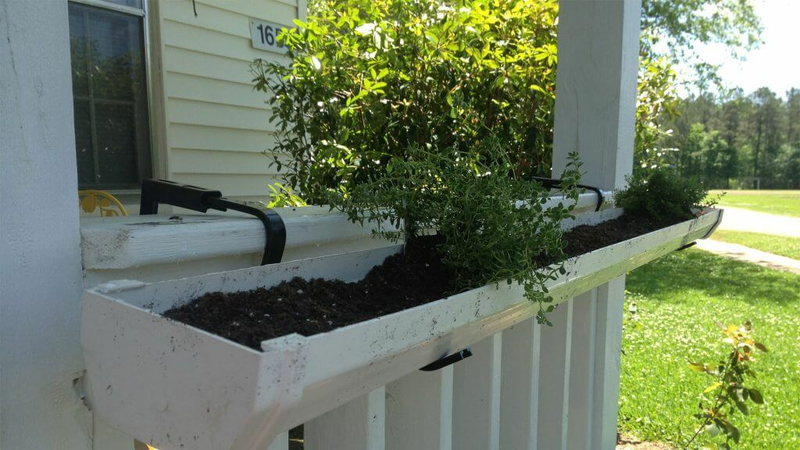 Consider gutter deck railing planters! 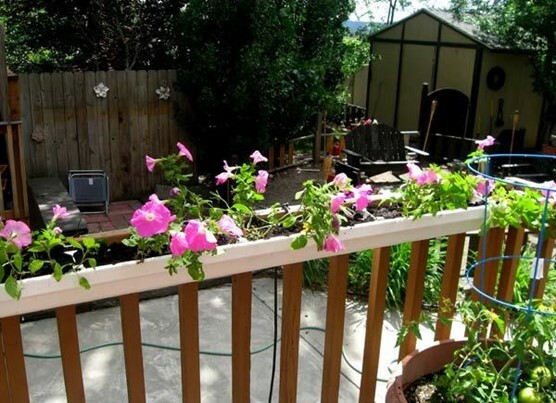 Attach gutters to your railings, to create lovely planters that outline the perimeter of your deck. Choose brightly colored flowers for an eye-catching WOW factor! When choosing which plants and flowers are ideal for your deck railing planters be sure to consider factors such as how much light the plant should be getting, how long it blooms or is in season, and if the plant is likely to need ample room to spread and grow. Some of the most common shallow root system annuals are; African daisies, Angelia, begonias, ferns, geraniums, gerbera daisies, herbs, impatiens, ivy, marigolds, perennials (ivy, coreopsis, or grasses), petunias, portulaca, sweet potato vine, verbena, vinca, and zinnias. Whatever you choose to plant will looks AMAZING! Let’s take your garden edging to a new level! Get ahead of the creative curve and use gutters as garden edgers and for landscaping details. The concept is simple, cut away the earth to allow for the gutter to sit flush with the ground and fill it with either river rocks, pea pebbles or some other sort of ornamental stone to bring definition and visual interest into your landscaping. Remember to add a few holes to allow the gutter to drain!